Pulsion diverticula of the distal oesophagus are considered to be complications of abnormal intraoesophageal pressures. Cross et al.1,2 supported the concept that spasm of the inferior sphincter accompanied by increased contraction pressures in the oesophageal body is responsible for both the symptoms and the appearance of the diverticulum. Allen and Claggett3 and Benacci et al.4 have reported significantly fewer leaks with secondary sepsis when a myotomy is combined with diverticulectomy than when a diverticulectomy alone is performed. 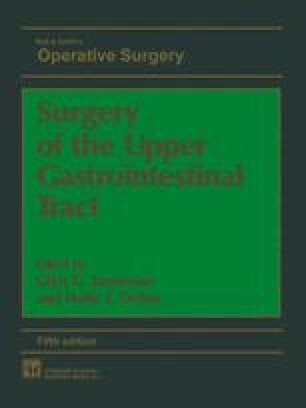 When surgical treatment is indicated for distal oesophageal diverticula, the diverticulum should be excised if it is large enough and the underlying motor abnormality corrected. Following myotomy, a significant weakening of the gastrooesophageal junction results, and an antireflux repair is added to the myotomy to prevent reflux damage to the oesophageal mucosa. A partial fundoplication is preferred, as a more complete wrap causes functional obstruction to an oesophagus made powerless by the myotomy.